If you’re in the market for the best shower seat, then you certainly could use a bit of advice on the matter. We’ve browsed through many shower seat reviews to bring you this guide, and our findings show that the first product to consider is Dr. Kay’s Adjustable Height, due to its various benefits. For example, it comes with a lightweight design, only weighing 4 lbs. This means that even a customer without much strength can move it without receiving help, so it encourages seniors to be more independent. The height limits are 12.5 and 18.5 inches, and you can adjust to anywhere in between, depending on where you feel most comfortable. Last but not least, this chair ensures the user’s safety. It’s feet are coated in a non-slip rubber, so it’s stable regardless of the surface you place it upon. Should this model be unavailable, we suggest you try the Vaunn Medical Tool-Free instead. This option is lightweight, stable and incredibly comfortable so that you don’t have to sacrifice your comfort for increased safety and protection. The unit weighs only a measly 4 pounds but it can hold a total weight of 250 pounds. The compact design of this option makes it capable of fitting even in the smaller tubs and showers. A few customers were not entirely satisfied with the quality of the legs, claiming that if you are close to the weight limit, they can buckle and collapse. For customers that want to get increased performance in a compact and easy-to-assemble body, the Dr. Kay’s Adjustable Height is an option that won’t disappoint. The new model from Vaunn is made with a heavy-duty anodized aluminum frame that has a total weight capacity of 300 pounds. The high-density polyethylene seat is comfortable and anti-bacterial. The back support and padded armrests are removable and the legs are height adjustable to meet your preferences. Owners have said that the bolts that attach the legs to the bottom of the unit will require frequent retightening, otherwise the legs can become loose. We recommend this option if you want to get a heavy-duty product that is incredibly comfortable and versatile thanks to its ability to handle a wide range of activities. The Dr. Maya option is a universal chair for showers or tubs. The width and height are fully adjustable so that you can customize the unit according to your needs. Durability is another key advantage of this model, seeing as it is made with four heavy-duty anodized aluminum legs that will not rust over time and offer reliable support. While most buyers had only high praise about this model, we did find a few customers that have complained about the stability this option offers. The Dr. Maya Adjustable Bath is a fully-adjustable and high-quality shower seat that is guaranteed to offer increased comfort and reliability in almost any situation. Showcased below are some alternatives we picked from what we believe are some of the top products currently available for sale. If you’re looking for a good shower seat, undoubtedly you’ll find something to catch your eye in the list below, where we’ve displayed all their exciting features. This item is designed to help seniors who have less strength to handle this task mostly on their own. It features two built-in side handles that help you grab it and maintain a secure grip. It’s lightweight, weighing only 4 lbs, meaning most people can lift it without much effort. Despite its apparent fragility, this seat can withstand up to 250 pounds, so it’s adaptable for a wide range of customers. Speaking of adaptability, you can adjust the dimensions depending on how you feel most comfortable. As far as shower seat height goes, this one can reach anything between 12.5 and 18.5 inches, so you won’t be left struggling. Concerning safety, you should know that this item manages to offer an anti-slip surface that provides a stable environment every time you take a shower. Perhaps pairing it with a reliable non-slip bath mat for the elderly would reduce the chances of an accident. If you have limited mobility and strength and you need to sit comfortably to properly shower, then this handicap shower seat, with its lightweight design and versatility, is undoubtedly one of the items you need to consider. First of all, the level of comfort this model achieves hardly has any competitor among other alternatives. The armrests are padded, and the seat is made of antibacterial polyethylene that not only preserves hygiene, but it also has excellent durability. The frame itself is the main structure that holds the weight of the user. Made of sturdy aluminum, the framework manages to be lightweight while withstanding a pressure of approximately 300 lbs. For preserving the comfort of the customers, back support has been added, but it can be removed if you find it unnecessary. The seat itself only weighs 6 lbs without the back, so it’s not difficult to move it or store it. You’ll have a hard time finding a product that offers such high safety standards among other shower seats for seniors. This model comes with a suction cup handle that you can use when getting in and out of the bathtub. It’s developed to help people with low mobility to shower independently. Aside from this aspect, the seat is made of white hard plastic and has eight drainage holes. Its height can be adjusted between 12 and 19.5 inches, which is more than most competitors offer. Also, the measurements of the seat, 10.62 by 17.32 inches are wide enough to let you sit in a comfortable position. The other material used in the manufacturing process is anodized aluminum, which makes up the frame. This is what makes the final result lightweight yet resistant since it’s able to hold up to 300 pounds. Two lateral seat handles let you move this design with ease. A comfortable bath seat for elderly citizens, this model manages to offer a relaxing experience due to its multiple benefits. It lowers the fall risk of those who suffered injuries or have low mobility by providing a stable surface through the non-skid rubber tips. Its angled legs are designed to increase the total weight it can withstand. The anodized aluminum frame can hold up to 300 lbs while being light enough to allow this product to be transported by customers with less physical strength. The seat is made of antibacterial polyethylene and measures 19.5 by 12 inches. It also features small drainage holes to improve the experience and reduce the chances of certain items, like hygiene products slipping through. To increase the comfort of the customer, the manufacturers have added a removable back to this chair. The height of the legs is adjustable (between 12.5 and 19.5 inches), and assembling the chair doesn’t require any particular skills. Try this alternative if you’re looking for a seat that’s made to withstand up to 300 lbs while featuring a lightweight aluminum frame that will make it easy to handle. It’s great for encouraging seniors or those with less mobility to shower independently, and paired with the right non-slip bathtub mat it can significantly reduce their chances of falling. The chair measures 13 by 13 by 13.5 inches, and the height can be adjusted from 13.5 up to 21 inches in 1-inch increments, allowing you to find the option you feel most comfortable with. This model’s legs are crack-proof to make sure long-term use is guaranteed and treated against corrosion so that the product will preserve its appearance. The new design features a pinch-free cover that helps clumsy users avoid hurting their fingers while adjusting the chair. A click sound will be heard when the height is stabilized. The rubber support collar keeps the legs in place. This is perhaps one of the alternatives that can withstand the maximum amount of weight, going up to 350 lbs. Most of its competitors recommend 300 pounds, so this will suit heavier patients. Providing the customer with a comfortable bathing seat that helps them shower independently, the platform lowers the amount of strength they need to put in. The sturdy aluminum frame is durable, but it doesn’t weigh too much, and it’s easy to move. It doesn’t take any mechanical skills to put the pieces together. Its height can be adjusted between 16 and 21 inches in 1-inch increments, to make sure you’re comfortable with your choice. The seat measures 13.5 by 16 inches. It also features padded armrests and a back seat for additional support. Its feet are covered in non-slip material to makes sure no accidents occur. Make sure you use a hydrating body moisturizer for aging skin after stepping out of the shower to enhance the results. As far as cheap shower seats go, you need to check out this model, given its enhanced comfort and roomy seat. All kinds of body sizes can fit in this chair without struggling, given that it measures 16.5 by 21.75 by 16 inches. What’s more, its height can be adjusted between 16 to 20.5 inches. The visible height indicator makes it easy for less experienced customers to use this device without any difficulty. The ½-inch increments allow you to choose the dimension that is just right for your needs, without any compromises. Unlike other items that can withstand less weight, this product holds up to 350 pounds, so it’s suitable for heavier users, as well. It comes with a backrest for enhanced comfort that can be removed if it is unnecessary. No tools are required to assemble this design. Its lightweight frame allows you to grab it and store it without putting too much effort into the process. A particularity of this model is the fact that it can withstand up to 400 pounds, which is more than most of the other alternatives also reviewed in our list. It features a comfortable seat, which improves the quality of bathtime. The platform is stable and lowers the risk of accidents, which makes it excellent for people with mobility issues. If you want to increase the level of safety, matching this item with a pair of non slip slippers for elderly citizens might be a good idea. Another relevant aspect is the adjustable height, which allows the customer to choose any dimension between 16 and 21 inches, depending on what they feel most comfortable with. The built-in side handles help you pick up the chair and maneuver it with ease. This model fits into any size of cabin, and the chair even features a tub bench that can hold a reliable handheld shower head for the elderly, to help them shower independently. Much like other similar models, the Medokare alternative comes in separate components but does not require any mechanical skills to be assembled. The frame is made of heavy-duty aluminum, lightweight yet sturdy, anodized to make sure it withstands being used in wet environments. Its height adjusts from 12.5 to 18.5 inches by sliding the legs up and down. The structure is stable, being an excellent choice for patients struggling with a handicap. It holds up to 280 lbs and offers a comfortable seat, padded with a soft material. Drainage holes pierce the platform. Despite being fairly light, this frame is strong and durable. A cutout on one of the sides makes for the perfect place to keep a showerhead handy, encouraging disabled patients or people struggling with low mobility to shower by themselves. Due to its reduced dimensions, it fits even in smaller tubs. The chair features anti-slip rubber leg covers to increase its stability. This item’s height can be adjusted anywhere between 16 and 20 inches, in 1-inch increments. You’ll be able to find the right option for your size undoubtedly. The seat itself is roomy, measuring 13 by 16 inches, a good fit for many body types. To offer the customer increased comfort, the manufacturers have added removable pads on the armrests. This helps especially if the patient is struggling with disability and needs an extended amount of time to get out of the chair. The frame is made of anodized aluminum, the preferred material when it comes to shower seat construction. Aluminum is sturdy and durable yet lightweight, allowing even less robust customers to maneuver this item easily. The treatment applied will prevent it from developing rust and turning a different color. It holds up to 300 lbs, a standard weight limit with this type of product. It’s a reliable alternative that comes at an affordable price. One of the minimalistic options in our list, this chair is excellent for those who don’t want to deal with intricate designs and confusing instructions. The seat comes with a curved platform with a non-slip surface that’s perforated by drain holes, a detail that, again, prevents the customer from slipping while showering. The height of its legs is adjustable and varies between 14 and 21 inches so that you can find the option that best suits your preferences and your measurements. 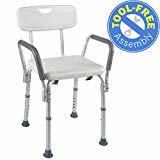 This item provides its customers with stability and comfort, encouraging disabled patients to perform this otherwise tedious task independently. It can withstand a maximum weight of 250 pounds, due to the strength of its aluminum structure and the non-slip polyethylene seat. The side handles will help you move this item with ease. In case you’re worried about its durability, you should know that a lifetime warranty protects the Moen design. Finding the best shower seat for elderly citizens is no easy task, but with our help, you can browse through the many alternatives available knowing what the features that you need to keep an eye out for really are. We’ve outlined the most relevant aspects in the buying guide below, so you’ll have no problem spotting them when necessary. Since these products roughly come in the same dimensions, the one aspect that can genuinely make a difference regarding what best suits your body is the height of the bath seat. Most models allow the customers to adjust to heights between 12 and 19 inches, which should provide a range of options that are broad enough to satisfy the needs of almost anyone. If you know it’s difficult to find the option that’s right for you, scour the market for lower or higher measurements. What you shouldn’t overlook regarding height is the increment. For you to be comfortable, opt for a 1-inch increment to make sure the perfect height is within reach, and you won’t be left struggling. This is a product that needs to be strong enough to withstand weights up to 300 lbs but still light enough to be easy for a patient with low mobility to move it without struggling. These requirements can be achieved by choosing an aluminum frame, which barely weighs a few pounds but is very sturdy and durable. If you go for the anodized version, it might cost a bit more, but the frame will be preserved in time. Perhaps the best material for shower bench seats is high-density polyethylene because it provides a comfortable platform, but it can withstand and distribute weight correctly. Other alternatives such as hard plastic have a shorter lifespan. The installation process should be pretty accessible, without requiring any specific mechanical skills. Given that most of these items are delivered disassembled, it shouldn’t take an engineer to put them together. One of the main aspects of this item is that it’s developed to help those with lower mobility to shower independently, without relying on help from somebody else. This means the product is supposed to lower the risk of any possible accidents by various means. For example, the legs are usually covered with a rubber coating, which increases the stability by making sure that the chair does not slip no matter the surface you place it upon. It might help if you use a suction handle in addition to this because getting into the bathtub and onto the seat might be just as much of a problem as showering standing up. Another small design hack that manufacturing brands use to lower the risk of accidents is adding a few drainage holes that evacuate the accumulated water, making sure the customer doesn’t accidentally slip off. Of course, in the case of a disabled customer you have to make sure extra safety measures are adopted and be extra cautious. It might help looking through reviews of power wheelchair alternatives since a shower seat alone might not solve your struggles. Aside from providing a stable environment that lowers the risk of hurting oneself during bathtime, these designs should also concern themselves with the comfort of the patients. As we’ve said before, perhaps the best option in this regard would be choosing a high-density polyethylene seat. Any extra detail might prove to be of help in this situation, including a backrest or padded armrests. The latter in particular is a feature that’s not too common, so it’s worth keeping an eye out for. Speaking of comfort, if you want to have all that’s needed for a relaxing bath within reach try using a handheld shower head. You also need to make sure that the seat is wide enough to accommodate your body. Otherwise, you won’t be able to enjoy yourself.